A new carving of Christ on the cross said to be a lost masterpiece by the artist Michelangelo has been unveiled in Italy. 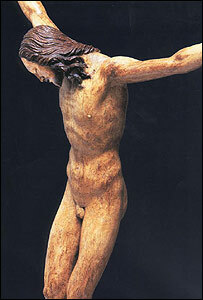 The Museo de Horne in Florence will show the 41cm tall, anatomically correct carving of Christ, until July. Experts said the artist had achieved such a lifelike look because he had used as a model the body of a young man who had been dead for 48 hours. It is very similar to a carving in Florence's church of San Spirito. The carving is made of limewood and shows Christ's head slumped to one side. It had become detached from the cross, and is thought to have been carved by a 20-year-old Michelangelo in 1495, possibly for a monastery. The artwork's authenticity had been proven in a book by renaissance art expert Giancarlo Gentilini, the UK's Guardian newspaper reported. The paper said the piece had changed hands between private owners in the ensuing centuries, and had not come to the attention of Italian art authorities previously. The piece belongs to a private collection and will be returned to it after four months.